Being savvy in the digital age is important to Ms Stephanie Seow, 27, who goes online to do most of her shopping and carries very little cash. She is thrilled to have an OCBC Frank Credit Card that gives her 6 per cent rebates on her online purchases as long as her overall spending on the card is at least S$500 a month, a condition she easily meets. 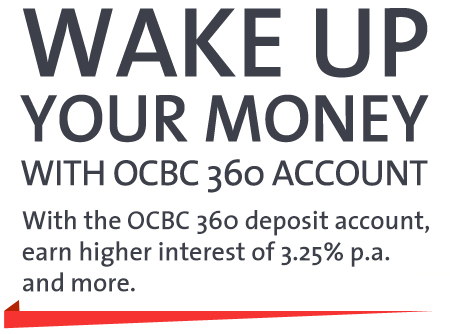 And after she opened an OCBC 360 Account last year, her credit card spending has also enabled her to earn additional interest on the account balance. Ms Seow was in university when her father opened an OCBC savings account for her. She obtained an OCBC Frank Debit Card on her own and upgraded to the Frank Credit Card when she began working. Ms Seow, who is a digital marketing manager in the fashion industry, says a friend who was already a 360 Account holder convinced her to sign up for the account. "My friend told me this is the way to maximise your savings and get more interest out of it," she says. Based on information from her friend and the bankï¿½s website, she found that she only needed to credit her salary into the account, pay at least three bills online and spend a minimum sum on OCBC credit cards to qualify for the various bonus interest rates. As she was already doing what was required to earn the additional rates, she proceeded to open the 360 Account and get her salary credited into it.
" If you have a savings goal and you want to put your money where it will generate better interest for you, it makes so much sense to set up a 360 Account rather than any other ordinary deposit account. " She also makes three online bill payments each month from the account for her credit card spending, income tax and the Blue Chip Investment Plan where she invests S$100 a month, which is the minimum required. The regular investment scheme by OCBC offers access to an array of blue chip stocks that are components of the Straits Times Index as well as an exchange-traded fund based on the index. Ms Seow, who wants to further her education, has set up a savings goal through Money In$ights, a personal financial management tool available through OCBC Online Banking, where she automatically parks about 10 per cent of her monthly salary. "I put aside that for the month, then I can spend the rest," she says. She transfers a portion of her monthly income to her Frank debit account, which she uses for expenses. "If thereï¿½s any excess at the end of month, it goes back to the 360. But if thereï¿½s none, then too bad," says Ms Seow, who believes life is about striking a balance. While committing to her long-term education goal, she is willing to spend on meaningful experiences, including going for an occasional holiday. A few years ago, Ms Seow started running summer camps in Mongolia for former street children who live in a shelter. Though she no longer runs the camps, she still visits the children. "I think money is a medium to enrich yourself rather than the end goal itself. Instead of being materially rich, I want to be more enriched in other ways, and touch young lives," she says. When it comes to tracking her spending, at least once a week, she goes online to view her credit card e-statements. She says the online banking platform has a friendly user interface. "I like the portal a lot," says Ms Seow, who also consults an Excel spreadsheet as that includes her entries for petty cash and the expenditure from it. She also finds it very easy to use OCBC PayAnyone, a feature through the OCBC Mobile Banking application, to transfer money to her friends via her smartphone. All she needs is their mobile numbers. Having enjoyed higher interest rates from the 360 Account, she actively shares the benefits with her friends. "If you have a savings goal and you want to put your money where it will generate better interest for you, it makes so much sense to set up a 360 Account rather than any other ordinary deposit account," she says. These tables offer an example of how Miss Seow earns up to S$1,355 in interest from her OCBC 360 Account and S$720 in credit card rebates a year. *Interest is calculated based on an account balance of S$60,000 and insured up to S$50,000 by Singapore Deposit Insurance Corporation (SDIC). Terms and conditions apply. **Frank Credit Card online spending rebate is capped at S$60 per month.